The Media Relations Unit is staffed by a Public Information Officer. The PIO is responsible for releasing Sheriff’s Office information to the media and the public. This is done through direct communications with the investigators and staff which work on cases. Press Releases are written and developed concerning major crimes, arrests, or other topics of interest. 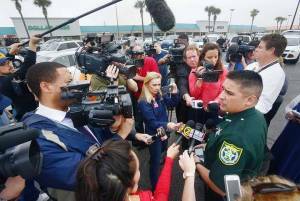 In the event of a major crises, the PIO at the direction of the Sheriff will coordinate news conferences and disseminate news to the public on a timely basis. The Media Relations Unit also is also responsible for our social media outlets, such as the Sheriff’s Office Website, Facebook, and Twitter accounts.